Visiting the virtual Museum of Parallel Art is a very special experience you’ll share with someone. You’ll express your thoughts and feelings towards art with cards, or try to view the world as your peer and guess the cards he or she has played. Comparing cards will prompt conversation and is sure to connect you two. This game was originally made in 48 hours by Neverpants (Dom2D, technobeanie & seventysevian), featuring art both classic and new, with contributions by many amazing artists like Anthony Clark, Justin Chan, Nic ter Horst, Tom Eccles, Aliceffekt and way more! 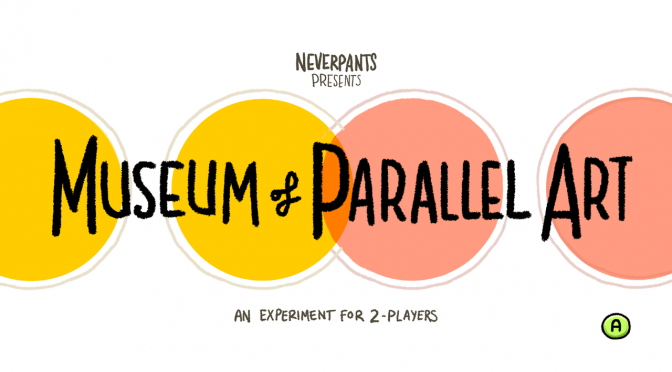 Randomly generated from a database of over 200 “paintings” and a multitude of cards, the Museum of Parallel Art is different every time you visit. Museum of Parallel Art – Trailer from Dom2D on Vimeo. Basically, it’s an online game where you go through a digital museum with 10 cards which you need to assign to 6 random paintings. You decide which card represents which painting the best. Then a partner does the same thing, but instead of making their own connections, they have to guess which cards the first person placed on each painting. Why am I mentioning this on replicated typo? It seems to me that this game could potentially make a fun language game experiment because choosing the same card to represent a painting is tantamount to deciding on a signal to represent that painting. Researchers could potentially use this paradigm as a fun way to look at the effects of iconicity on bootstrapping communication systems, or look at how communication strategies arise over repeated instances of the game. An article on Rock, Paper, Shotgun already hypothesised that during the second round of the game, the cards had much less transparency between the paintings they were meant to represent. Though perhaps this might just be because of the paintings being randomly generated from a set of hundreds of paintings. It’s also interesting to think about the levels of theory of mind you need to play this game, or the effects of having a shared history with the person you are playing with. Yes, this is cool, thanks for pointing it out Hannah. Since in this game you are given a set of signals and a set of meanings, and the game is about pairing them up, then of all the language evolution experiments out there, I think it’s most like Selten & Warglien’s PNAS paper, except they also had something odd about each signal (card) having a different cost. There are plenty of models using this framework though. Next Next post: Happy Darwin Day!